​Rating: This Purina Beyond Salmon & Whole Brown Rice Natural recipe receives a Petlovetoday rating of 4.4 out of 5. ​Purina cat foods can be purchased at a variety of local and national pet food chains including specialty stores and some veterinary offices. You can also shop the Purina pet food store online or buy Purina cat food products from various online pet food retailers like Chewy.com and PetFoodDirect.com. The Purina website claims that their products don’t just meet AAFCO standards, they surpass them. Purina suggests that they use AAFCO standards as a starting place and that each of their products goes above and beyond these requirements to provide pets with optimal nutrition. It is one of Purina’s goals to ensure that their products are the kind of foods that pets want to eat and that they are highly digestible to ensure nutrient absorption. Purina claims that they are a global leader in pet nutrition research and that they study the quality and effects of every ingredient they use. In terms of the production and manufacture of their products, Purina works with regional venders, often sourcing their ingredients from growers in the same region as their plants. The website suggests that Purina puts their vendors through a rigorous review process to ensure quality of the ingredients. Though Purina is headquartered in St. Louis, it has operations all over the globe. According to the Purina website, 99% of Purina cat food products are produced in the United States, though the website does not provide many details about the company’s production facilities. On various Purina brand websites (such as Purina ONE), the company claims that its products are only produced in company-owned facilities but it does not state where they are located. The fact that Purina is the second-largest global pet food producer suggests that even the 1% of products that are not produced in the U.S. could still be a very significant number. Because the Purina Company is made up of so many different brands, it is difficult to provide a comprehensive overview. Many of Purina’s cat food products are mid-range in terms of pricing compared to other brands and an analysis of several product ingredient lists reveals a wide range of quality in terms of ingredients. The Friskies brand, for example, is one of the most affordable ​cat food brands and many recipes are made with questionable ingredients like corn, wheat and soy. Even the Fancy Feast brand which is marketed as a gourmet cat food includes ingredients like meat by-products, wheat gluten, and artificial flavors. The Beyond line of cat foods is marketed as a natural cat food product available in several grain-free formulas and it is probably the best Purina brand, made with real meats, whole grains, and dried vegetables. 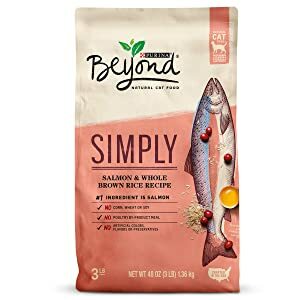 ​Though many of Purina’s ca﻿t food brand﻿﻿s are made with low-quality ingredients and fillers, the Beyond brand seems to be a decent product. Marketed as a natural cat food, the Beyond line of cat foods is made with “real, recognizable ingredients you know and trust, plus essential nutrients”. These products are made with real fish or poultry as the number-1 ingredient with no poultry by-product meals and no corn, wheat, or soy ingredients. This product line is also free from added colors, flavors, and artificial preservatives. A review of several Purina Beyond dry cat food recipes reveals that these claims are true, but the fact remains that the Beyond brand is unique among Purina products in terms of quality. ​Salmon, chicken meal, dried egg product, pea protein, whole barley, whole oat meal, whole brown rice, dried yeast, beef fat preserved with mixed-tocopherols, dried beet pulp, natural liver flavor, whole cranberries, dried tomatoes, dried spinach, phosphoric acid, sodium bisulfate, calcium carbonate, salt, L-Lysine monohydrochloride, potassium chloride, taurine, choline chloride, Vitamin E supplement, zinc sulfate, ferrous sulfate, niacin, manganese sulfate, Vitamin A supplement, calcium pantothenate, thiamine mononitrate, riboflavin supplement, copper sulfate, Vitamin B-12 supplement, pyridoxine hydrochloride, folic acid, Vitamin D-3 supplement, biotin, calcium iodate, menadione sodium bisulfite complex (source of Vitamin K activity), sodium selenite. This Purina Beyond Salmon & Whole Brown Rice Natural Cat Food recipe is made with salmon as the first ingredient followed by chicken meal. 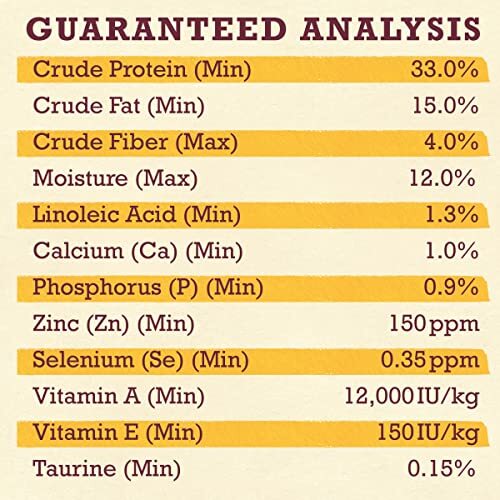 The inclusion of two quality animal proteins at the top of the list earns this formula major points – especially since chicken meal is a highly concentrated source of animal protein. It is somewhat troubling to see dried egg product and pea protein as the next two ingredients, however. Dried egg product is another source of animal protein but it is difficult to judge the quality of this ingredient because it could contain rejected ingredients such as unhatched eggs. Pea protein is not a harmful ingredient but it tends to be used by pet food manufacturers as a method of increasing the protein content of a product without adding more meat. The next three ingredients – whole barley, whole oatmeal, and whole brown rice – are all gluten-free grains that are digestible, as long as they are cooked properly. While these ingredients are not harmful, the inclusion of three sources of grain is somewhat troubling for a cat food recipe since cats have no biological requirement for carbohydrates. Whole cranberries, dried tomatoes, and dried spinach are likely included as additional sources of fiber as well as vitamins and minerals. The remaining ingredients are all supplements that Purina describes as “essential nutrients added for a complete and balanced meal”. Overall, most of the ingredients in this Purina Beyond Salmon & Whole Brown Rice Natural Cat Food are of decent quality though the proportions may be a little off.